With this library Sonokinetic is back where it all began. At the cradle of cultural history we found another intriguing and mystical vocal art form. Mr. Abraham Acharak blessed us with a divinely stunning performance and showed us music’s true meaning in multiple inspiring recording sessions. The proven concept of vocal performances based on copyright free songs, improvisations, in all keys and multiple speeds combined with cinematic vocal fx like poems, shouts, whispers and much more, is now crammed into just one instrument patch. Over the last few years we found that having multiple performances and fx available in one comprehensive instrument makes work as a composer much easier and more structured. Therefore we’ve invested in the first ‘built-in-one’ ethnic vocal library. We are proud to release this unique and authentic collection and provide you with an imaginative extension to your sound pallet. With this addition to your instrument toolbox you’ll have access to a truly one-of-a-kind vocal performance virtual instrument. Sonokinetic specializes in cinematic soundscapes filled with rich cultural diversity and with much respect for historic musical heritage. As such, “Yemenite” will happily stand alongside its peers “Tigris & Euphrates, Desert Voice, Voices Of Israel, Haka and Maasai”. “Yemenite” has mainly been built around traditional Yemenite Jewish music tradition. This collection consists of hundreds of unique and authentic melodic phrases, improvisations and spoken words. As far as tradition goes, Sonokinetic keeps its tradition alive by providing you with word-by-word translations, with lots of ancient texts translated to English for the first time. So again we feel we prove the significance of a well-performed musical idiom, high-end technical recording, craftsmanship of the UI, sample library with an all-new shiny product like “Yemenite”. 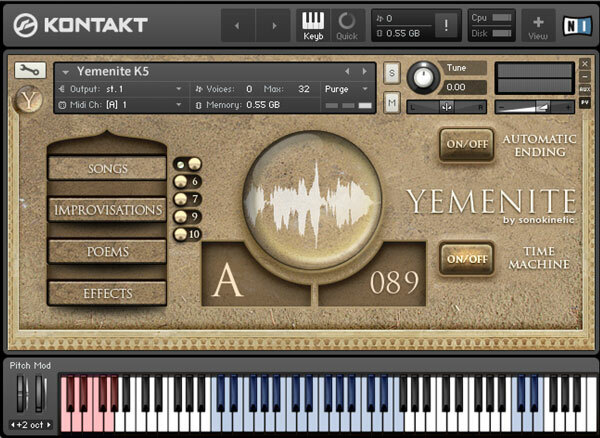 The main Yemenite GUI consists of an instrument group selector on the left, a sample behavior control in the middle, and a performance control unit at the right. Vocal performance Selector: is a section in which you select a specific voice performance by clicking the button. By default we saved the instrument to load the “Songs” patch. It purges only the samples that are needed for the part of the instrument you choose to use. Songs are based on traditional Yemenite songs, selected for their text content and complementary character for cinematic use. Improvisations are delved from hours of creative inspired chanting and filled with decennia of musical cultural heritage of the cantor. Poems and fx fill this collection with creative vocal sounds and fx of spoken words and typical very usable voice performances like whispering, hissing, shouting, calling and praying. For the songs we designed a Song Selector (picture left) option. When a harmonic key is chosen by pressing the corresponding keyswitch (Red: see keyboard explanation) the box displays the available songs for that particular key by displaying a group of switches in the main instrument panel. The amount of songs available in each key differs, due to the limitation of the Cantors vocal range and the setting of the songs. The amount will vary between 2 to 5 available songs in any key. 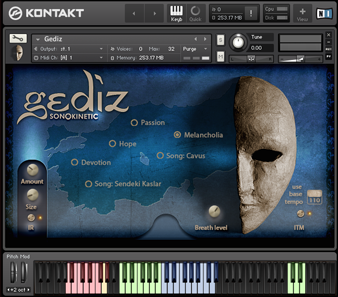 When you select one of these switches a message will appear in the activity monitor on the leftmost bottom corner of Kontakt, displaying the name of the song linked to that switch in that key, allowing you to look up the translations for the song. Translations are found in the 2.additionals/documents/translations folder. Red keys are key switches to select a harmonic key (for Songs and Improvisations). They range from A to G#. The green key displays the activated key switch. For Poems the red keys let you select a different poem. And in FX it toggles between different types of vocal sound effects. Blue keys mark the available amount of phrases per song, per harmonic key. For this instrument we provide you with a default setting of “Time machine” to On and “Auto endings” to Off. Auto Ending: A melodic phrase is different from a melody. Melodies are built from phrases. So to perform a correct musical vocal melody it is essential to have an option to end a phrase with a proper and logical finish. This can be automated by pressing the “Automatic Ending” knob. It will trigger a random ending (samples found at the utmost right of the keyboard marked in blue). 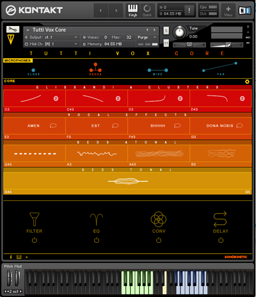 Time Machine: Tempo syncing made possible by the intelligent new engine “Time machine” by Native instruments created a massive amount of options for the composer. In each key and tempo “Yemenite” provides you with a proper amount of musical material to choose from. 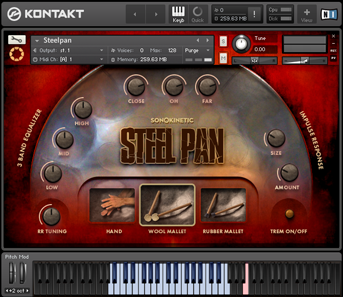 We initially build this instrument on the Time machine Pro settings available in Kontakt 5 and up. 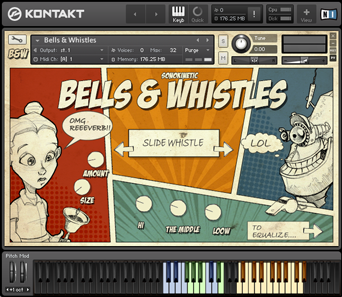 But we also provided Kontakt 4 patches.